This is ELAG. This is Made in Germany. You will never want to cook differently! Over the past 35 years, ELAG has specialized in the production of high-quality ceramic glass cooking appliances such as cooktops and grills. ELAG’s products like the LeMax Grills are known around the whole world. The direct cooking concept of the revolutionary LeMax Grills suit any ambitious cook or professional. Furthermore, ELAG focuses on the production of elegant and state-of-the-art cooktops “Made in Germany”. Due to large experience with ceramic glass, cooktops from ELAG prove to not only be high in quality, but also diverse. ELAG produces a wide range of cooktops with different stunning designs and sizes. and combined result in the most delicious meals. For over 35 years ELAG has specialized in the production of high-quality cooking appliances, such as ceramic glass hobs. All hobs are designed and manufactured in Germany. A HiLight or an induction cooktop from ELAG is built with components of the most recognized suppliers of the industry. ELAG offers a wide range of high-quality CERAN® stoves “Made in Germany” to its customers. The main focus lies in finding the best possible solution for ELAG’s regional partners worldwide. Cooktop reviews show that ELAG’s quality is state-of-the-art, long-lasting and durable. Customers value the quality in ELAG’s ceramic glass products and reckon them among the best cooktops in their category. The inventor of the original LeMax Grill! Never before at ELAG has a product been developed in such detail and with such strong focus as the LeMax Grill. The LeMax Grill is revolutionary in its way of cooking foods. Food is grilled directly on the ceramic glass surface, without pots and pans. Eggs, steaks, vegetables or even delicate crêpes are cooked directly on the surface. Cleaning after cooking has never been so easy. Ambitious cooks and even professionals value the detail in design and its functionality. This high quality table grill “Made in Germany” is unbelievable versatile thanks to its mobility. The LeMax Grill is used as a hot plate, cooking plate or griddle. This table grill is great for catering a party or an elegant sit-down dinners. The LeMax Grill is used by a large range of different cooks. Thanks to its versatility it has received many different describing names. Some may call it “the best hot plate ever”, as the LeMax Grills are used on parties or celebrations for keeping food warm and fresh. 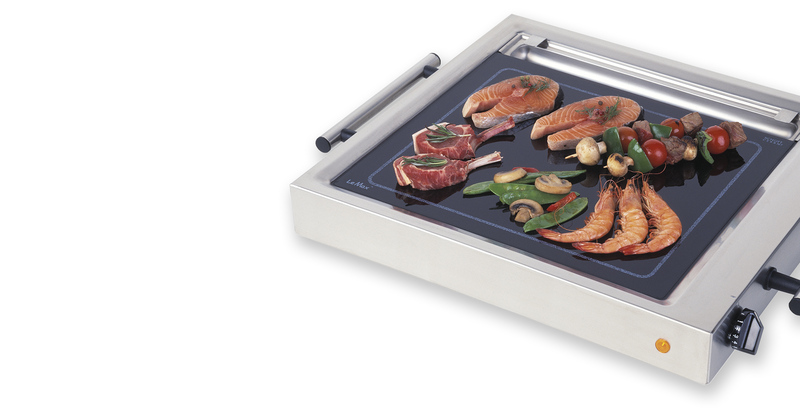 Others may call it the most powerful griddle around, as it reaches temperatures up to 360°C. The LeMax Grill can make thick steaks and delicate crêpes equally. The LeMax Grill is without doubts a ceramic glass grill, or so called CERAN® grill, made of strong and durable stainless steel. This stainless steel grill is also used in snack bars as a gastronomic grill or powerful table grill. Chefs also tend to call the LeMax Grill a high-quality catering grill. ELAG’s cooking appliances, such as the LeMax Grill products, perfectly suit restaurants, hotels, catering businesses, snack bars etc.. ELAG has always focused on delivering long-lasting quality to its customers. Professional cooks love using the LeMax Grill products due their mobility and versatility. Even many French chefs and Traiteurs call it “le meilleur produit de cuisson pour cuisine professionelle” – the best cooking product for the professional kitchen. 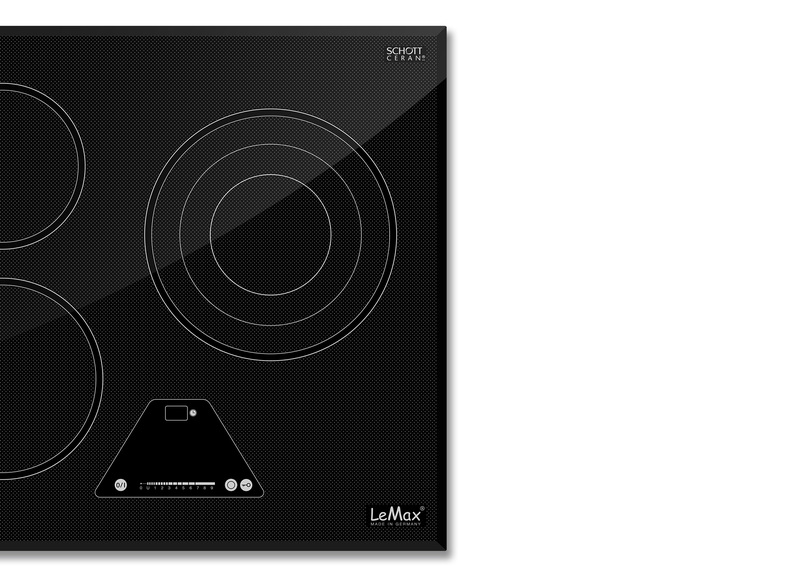 ELAG is proud of having developed the LeMax direct cooking concept: cooking directly on ceramic glass. This way of cooking has proven to be the most efficient for professionals, when performing Frontcooking or Showcooking.